Professional Eyebrow Pencil is used to enhance and refine the shape of the eyebrows. 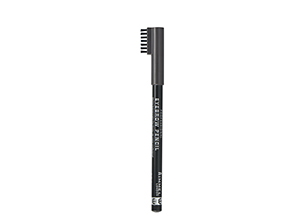 Can be used to fill gaps or lengthen the arc of the eyebrow to create the desired look. Available in three shades. I’ve never used an eyebrow pencil before because I always found it looked too obvious, but this one is wonderful! It blends very naturally with my eyebrows and doesn’t leave any telltale blobs or streaks. The crayon is hard and fine, but applies very easily and smoothly. I can tell it’s going to last for ages because I haven’t had to sharpen it yet even though I’ve been using it for weeks. The colour is a very clever shade; I can’t imagine an eyebrow colour it wouldn’t complement beautifully – and it even multitasks as eyeliner. This is a quality product – the pencil cap is made of strong, durable plastic (not the cheap kind that cracks easily), and it incorporates a nifty little eyebrow brush that’s sturdy and stiff enough to groom even the most unruly eyebrows. I’m converted! This is the only Eyebrow liner I use. Most of the time I don’t use a concealer to shape my brows because this liner is lighter and if you use it correctly with the brush, it’s Perfect! It’s light and looks natural, especially for people who are too lazy to do their brows every day or just like the easy natural look that’s not too heavy or too dramatic. Not such a fan of this product. There are other affordable brands that do the job better. You really have to drag the pencil which leaves rather streaky lines and that brush, seriously??? I used to fill in my brows with eyeshadow only, which is super easy, but after watching too many tutorials on doing brows, I wanted to move over to pencil products. The colour on this one is great for me. I have very dark roots and eyebrow hair. I have quite thick brows, but they are quite patchy. This works perfectly for that. The product glides on smooth and it doesn’t need much pressure like cheaper, chalky eyebrow pencils. However, I have to warn you that this is very pigmented and creamy. So if you get a little heavy handed with the pencil, you will end up getting drag-queen-like brows. You have to work very carefully, or else you will have to redo everything. I did not like the weird brush at the end, at all; it is so difficult to remove excess product, as the shape is a challenge to work with. You either transfer product to your skin around the brows, or you get the hair all messed up. I would have loved a normal eyebrow ‘spoolie’, which brushes out the hair while removing excess product. This just swishes it around from one side to the other. Maybe I need more practice? I love Rimmel products as they are really great quality and value for money and this eyebrow pencil is no different.